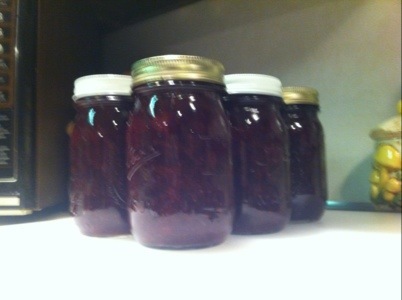 Last night, Tom and I made our first batch of home made strawberry jam. This past Saturday, we went strawberry picking at Jones Family Farm in Shelton, CT and picked a wonderful basket of berries, weighing in at 10.4 pounds. Is was my first time ever picking strawberries, and I was loving it. 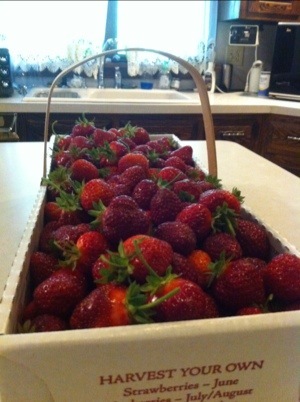 It’s so much fun to pick them, we didn’t realize until after we got home just how many strawberries are in 10.4 pounds. So we began to ponder, what to do with all the berries before they spoiled? Make jam!! So we googled and found a recipe that we wanted to try, one that doesn’t call for pectin and white sugar like most recipes do. 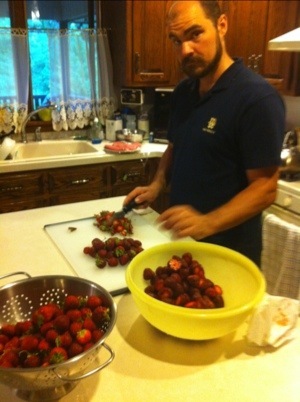 We began by prepping the berries. We hulled and halved 2.45 kg strawberries. Then we washed the strawberries and .250 kilos blueberries — we were supposed to use 6 ponds of strawberries for the cope, but we ran a little short, and we had to measure in kills since that’s the only scale that lives in the kitchen, .448 kilos = 1 pound). Once the berries were ready, we put 3 3/4 cups honey, 2 tbsps freshly squeezed lemon juice, 2 small grated apples and all the washed berries in large pot and mixed it all together. 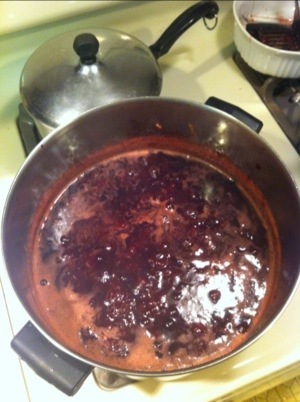 > continued to mix the pot together over increasing heat until it reached a low boil. 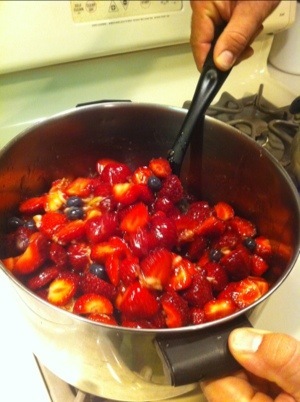 Once it was boiling, we began to mash the berries for 20 min with a hand potato masher. 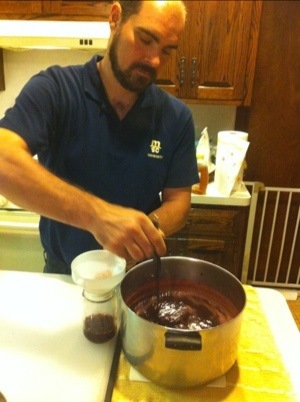 We then continued to boil mixture for 65 more min — it was boiling for a total of 85 minutes. While boiling the mixture, we sanitized utensils, lids and pots. (We had already sanitized the jars in the dishwasher.) Also, we got another pot of boiling water going for the “processing” phase. Once the jam was done boiling, we laddled (if that’s even a real word) the jam into 6 pint size canning jars with the help of a funnel (which we cut the bottom small neck off of so the jam could pass through with ease). Once the lid was on, Tom “strong finger tightened” the bands on the jars. We then placed the 6 jars into our pot of boiling water for 10 min, all the jars were covered with 2″ water during this process. After 10 min, we took the jars out of the water and placed them on a cutting board on the counter. While cleaning up, we heard 5 of 6 lids pop within 5 min. We covered jars with towel and blanket and let sit overnight. We will move the jars to a cool, dry location later today once they are sealed. This weekend I decided to become a chef! Well, really I just decided that I need to expand my horizons in the kitchen and elaborate my knowledge of what I can cook. And yes, this idea was partly driven by the boy’s need to eat different meals, but also because I want to be able to cook delicious and healthy meals, not just Mexican food. Saturday night I tried homemade pizza. 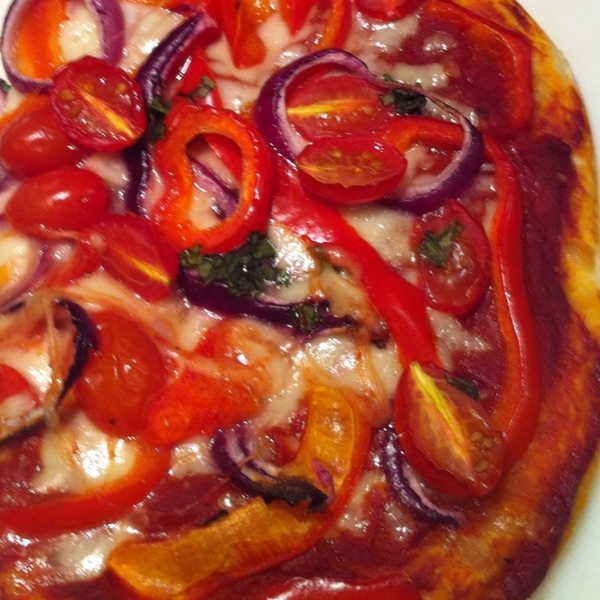 Since I’m lactose intolerant, I made a cheese free pizza (yes, they do exist!) and then I made a veggie pizza too. The cheese free pizza was made with Trader Joe’s pizza dough rolled out with pizza sauce spread on top, baked until the crust is ready. 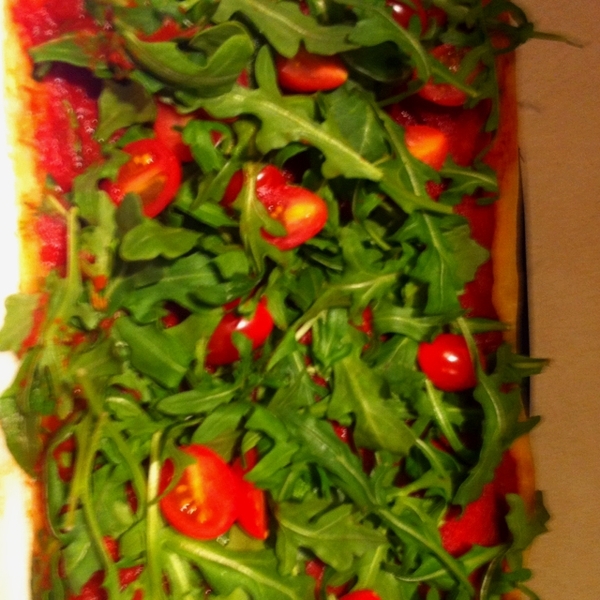 Once the crust was ready, I added fresh arugula and cherry tomatoes (halved) to the top. **I stole this idea from a pizzeria in Manhattan where I went for a work dinner one night, and my co-workers ordered me a similar pizza, though that also had prosciutto on it too — very tasty. My other pizza started with the same base, but also had cheese. On top of the cheese, we piled sliced red bell peppers, sliced red onions, some more halved cherry tomatoes and a sprinkle of basil leaves. This one took longer to cook, but again was ready once the crust was just the right crispness on the bottom. Homemade pizza wasn’t where I ended. On Sunday night I tackled cooking fish for the first time ever (which also meant buying fish for the first time ever…) I saw a recipe on food.com on Saturday that I wanted to try. It sounded tasty, and healthy. I took the recipe as a good starting point, but like always, I don’t follow directions to a T (unless I’m baking…) So I chopped up almost 2 full pints of grape tomatoes, tossed them in two tablespoons of olive oil, added basil leaves (torn into small pieces) and mixed in plenty of crushed garlic. Once it was nicely mixed, I spread it out in a 9″ x 13″ baking pan and roasted the veggies in the oven for 15 min on 425*F. Then I added in 2″ pieces of Alaskan cod spread throughout the dish, and tucked under the veggies. The pan was then put back in the oven for 12 minutes, until the cod was cooked. 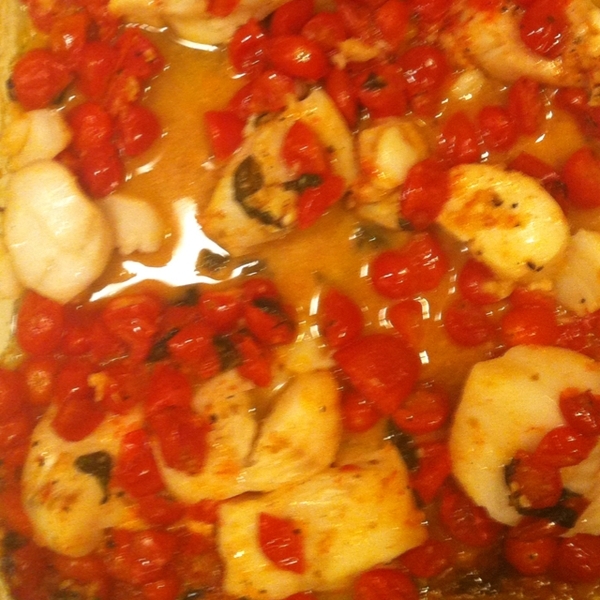 The tomatoes and cod were to die for and I think this dish would work with any white fish or white meat.